b. 1936. Lives and works in Bac Lieu, Vietnam. Vo An Khanh’s black and white photographs of the Vietnam War are rare testaments of human resilience. His carefully framed images carry a kind of ethereal beauty in their composition, as if a pause button has been pressed on a well lit stage. It is this meticulous capture, this ability to freeze a moment in time that indicates an intuitive response to context – for this particular environment in Vietnam was one of the harshest and most grueling, often calling for the shooting of a lens in tandem to the shooting of a gun.Vo An Khanh was born in 1936, in Ninh Quoi, Hong Dan, Bac Lieu Province, Vietnam. He was a farmer and made a living from fishing. In 1956, American forces caught his elder and younger brothers, triggering Vo An Khanh’s immediate departure for Ho Chi Minh City where he found himself working for the ‘Viet Long’ photo lab. In 1960, Vo An Khanh left behind his personal photo lab business (which he had by then created), wife and children to join the revolutionary cause of the North Vietnamese Communist Army, traveling to Khanh Hung, Tran Van Thoi and Ca Mau. During this time he worked as a local teacher in these areas, while also as secretary for the Printing Office of the ‘Van Cong’ (entertainment team). Vo An Khanh states ‘At that time we just did whatever we could because there were not so many people and I wrote text for propaganda.’During this time Vo An Khanh often traveled with a guerrilla unit documenting the front line of the Vietnamese resistance against the US, moving through swamp and mud where mosquitoes and leeches would feast on the bare legs and feet of the soldiers. At times, Vo An Khanh would climb trees to get a better angle on the action, having to be particularly careful at all times of the film he was carrying. Film was irreplaceable and extremely limited. Working undercover in the Mekong Delta, much of Vo An Khanh’s images were never published during the war due to chronic shortages of ink by local papers, where the fastest turn around time was two days for the distribution of news. By 1961 he was managing the Photography Department of the local revolutionary cause, taking care of events of entertainment and their promotion and documentation. It was under these duties that Vo An Khanh staged a rare touring exhibition (1962-75) of photographs in the mangrove madness, providing an opportunity for the local community to witness the bravery of their fighting forces. The two photographs ‘Mobile Military Medical Clinic’ and ‘Extra-curriculum Political Science Class’ were included in this traveling show, which Vo An Khanh developed at the time by himself using natural light. 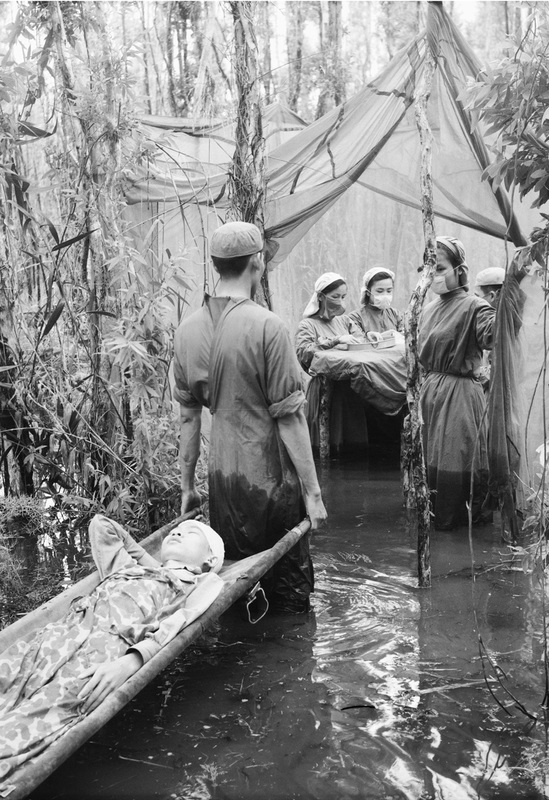 In the photograph, ‘Mobile Military Medical Clinic 9/1970’, a stretcher with an injured solder is being carried through swamp land towards a make-shift operation table where women knee-deep in muddy water, replete with face masks and medical clothing, carefully prepare their metal instruments beneath a netted canopy. When Doug Niven, curator of ‘Another Vietnam: Pictures of the War from the Other Side’ 2002, first saw this image, he had to double check that this scene was not staged, the setting appearing as if it had been choreographed. But this is the wonder of Vo An Khanh and his ability to capture a scene in its incongruity, the theatricality of light and his uncanny skill in holding the pose of the subject being one of the most consistent features in this particular body of work. 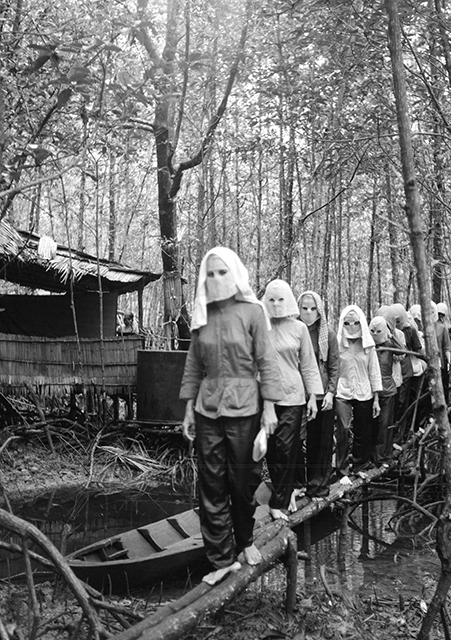 In ‘Extra-curriculum Political Science Class 7/1972’, a group of women walk bare-foot and in single file along a wooden plank bridge in the middle of Dat Mui Mangrove in Nam Can, Ca Mau Province. Each of these women wear a white head cloth, eerily cut out with holes for their eyes to see. The reason for this headdress was that these women were undertaking ‘Extra-Curriculum Political Science Class’, called back from their posts living and working with the enemy. These classes took place in the mangrove swamp in makeshift wooden huts where they would learn more of the political points of view of their forces and the changes in military situations across the country. Most of these ‘students’ were women and keeping their identities unknown to each other was a security measure. During class sessions, each woman would live alone in a small tent. Both ‘Mobile Military Medical Clinic’ 9/1970 and ‘Extra-curriculum Political Science Class’ 7/1972 were included in ‘Another Vietnam: Pictures of the War from the Other Side’ 2002 (co-organized by the International Centre for Photography, New York). This was the first time Vo An Khanh’s work was exhibited abroad. ‘Mobile Military Medical Clinic’ was also prominently illustrated and discussed in the New York Times that same year, in association with this exhibition. Vo An Khanh is a contemporary of fellow photographers Tran Binh Khoul, Mai Nam, Dinh Dang Dinh and Duong Thanh Phong to name but a few who also were active in documenting the resistance activities of the North Vietnamese army during the Vietnam War. The sale of this special edition of 40 for these two photographs will directly support the ongoing infrastructural and administrational costs of maintaining the artistic and educational activities of San Art – the only non-profit organization of its kind in Vietnam.